"Being Bizarro: Part 1 of 2"
In the Underverse, something goes wrong with the Bizarro workers. Superman, taking care of a strange beast near Jupiter, returns to Earth, only to be slammed by crazed white figures that adopt the appearance of whomever they touch, with one taking Superman's appearance. A square planet appears in Earth's atmosphere, startling Superman. The beings begin to rain down on Earth, turning people at a party with Jimmy Olsen and Perry White in attendance into Bizarros. Only Lombard, who is touched by one of the Bizarros, seems immune. Ron, Jimmy, Cat and Perry barely escape. Superman lands, doing battle with one of the Bizarros, one that looks like him (there is a difference in this story, note... Neal). Superman notes that he's not like previous Bizarros. Jimmy boards a blimp he calls with his signal watch, and calls P.R.O.J.E.C.T. to see what's going on. They inform him that a planet-eater (the square planet) is trying to appear less hostile by looking like Earth, and has corrupted the Bizarros into attempting to replicate. The Bizarros are staying on Earth's dark side, because, of course, sunlight weakens a Bizarro. The square planet begins to alter the tides, causing massive tidal waves. Superman finds that Lombard's blood is immune because he takes "performance enhancing" drugs. Which performance remains unspoken. He scribbles an anti-Bizarro serum on a card for Lois, then blasts into the square planet, sending it retreating back to the underverse. Superman, weakened by the opposite society, cannot fly, and soon weakens. One of the Bizarros explains that some Bizarros are born flawed, and introduces Superman to Zibarro, a Bizarro that speaks like Superman does, with opposite clothing. Story - 5: This one actually took two reads to get my head around. I had no idea how that planet was suddenly there, or the connection between it and the Underverse. Mostly I confused the fact that Superman was returning a sun-eater to... Jupiter (huh? Isn't that a dumb move?) and then a PLANET-eater was attacking Earth. I thought they were connected, and failed to make the connection. That was one awkward moment. I was also disturbed to see Superman making kissy-face with Lois as a tidal wave ripped through a major city causing untold deaths. It's out of character, and the kind of thing Morrison occasionally indulges in with his vision of the character, much to my own bristling. Beyond that, however, top to bottom this story is crazy, intelligent, strong, and Superman at his best. Zibarro is awesome, the idea of sunlight weakening Bizarro is something I fully plan on stealing and using if I ever get to write Superman comics, because it's so incredibly awesome, and the idea that Bizarros would have a Bizarro is so logical and obvious I'm surprised it hasn't been done like this before. Awesome. Everything in this universe is unique. Sometimes that's bad and annoying, mostly it's astonishing. I will gladly sacrifice the fact that the tides should have changed after Superman talked to Lois for all of the creativity that markedly makes this the best among comics. I am STILL, however, fervently, passionately, and almost to the point of boycotting this book upset with the release schedule. I ask myself, would I have waited four months for each issue of the Death of Superman? The answer is probably yes. Would it make me happy? NO. This is ridiculous. Professionals should be professional enough to release books in a timely manner. Or, if not, at least own up to that and wait until there's enough backlogged books to release things in a timely manner. They will continue to do this until we stop buying books that are late. You guys are far too forgiving. Heck, I'm too forgiving. But this is unfair to both the fans and professional standard. Maybe someone will have a solution in the comics, but it's just a flat-out tragedy that such an awesome book has to be mired with this specter. Yeah, they said it would be bimonthly, after first announcing it as a monthly, and now we have seven issues in almost two years? 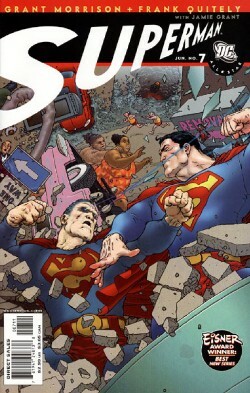 The first issue arrived in November of 2005. It is now April of 2007 and we have 7 issues. $#%@ing ridiculous. Art - 5: Amazing. Really, truly amazing. I love his work, and would love to buy it any time I get the chance and enjoy the subject matter. Zibarro, the humanity of all the characters involved... Frank really grows on you, and this issue is another in a strong of long hits. That said, cough, I would rather see him do an arc a year from now, an arc that is finished and timely, and have another arc with another penciller, even if it's not as good as Quitely. Cover Art - 5: Covers the subject matter contained in the book, has an awesome symmetry with the cross-eyed vision, involves an incredible, dynamic pose, and just screams at you to buy the book. Awesome.